Ben Clement is a self taught photo-artist who has created an incredible following through his recognisable style, sheer determination & drive. Ben's ongoing personal project Sister Cities - Pa Tuahine is being exhibited at Junior Space in December. This project looks at his home town of Gisborne in NZ and the relationship between its sister city in Australia, Gisborne in Melbourne. If you know anything about Photographic printing, you'll recognise darkroom legends Ilford! Ilford has been at the top of the digital resin coated paper range for a number of years now - producing the world's most popular photo inkjet paper in Ilford Galerie Smooth Pearl. In recent times, following their co-acquisition by an Australian company and a Japanese company, they've made tremendous waves in the fine art paper market. 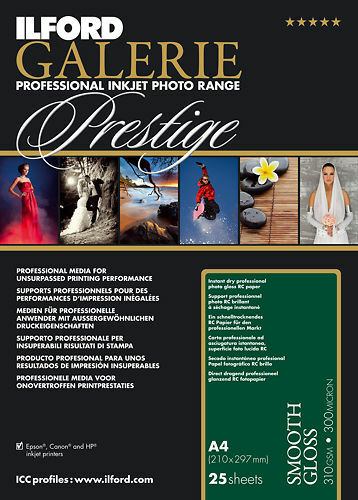 This combination of local support (= competitive pricing), and great products means they are rapidly growing in popularity in the art segment to match their already strong position in the digital photo paper segment. Special mention has to be made of Ilford's recent support of the photo and printing industry in Australia lately (after a fairly rocky transition in 2014/early 2015). They've been incredibly generous with stock and support in recent months, and it's a real pleasure and surprise to see this from a manufacturer. 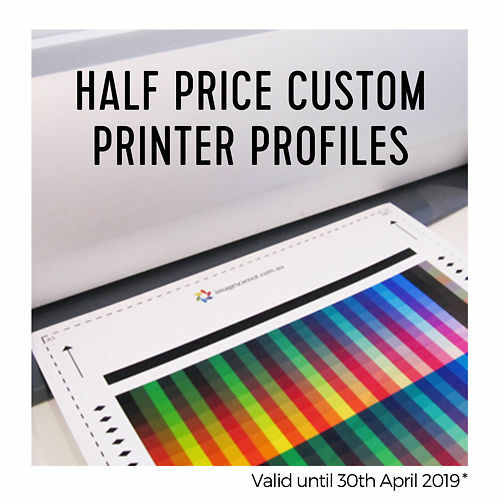 It's meant we've been able to print some great exhibitions and run some really special product specials. We're really looking forward to an ongoing good relationship with Ilford and seeing what they come up with next - if it's as good as Gold Fibre Gloss we're in for some treats! These are our recommended papers from the Ilford Galerie Range. 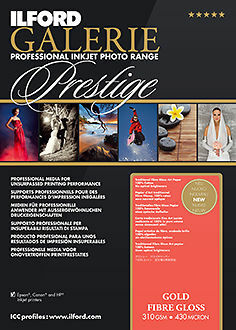 Smooth Pearl - The world's most popular inkjet paper with the classic photo look! Very robust, great for albums and indeed any context where prints will be handled. Our go to day to day photo paper. Gold Fibre Gloss - very new and exciting alternative to Museo Silver Rag and Canson Platine, and we think it's better than both of them...we're evaluating moving from those older papers to this in our own printing services. Smooth Cotton Rag -Ilford's new fine art smooth cotton rag, we're printing our first exhibitions on this in 2016 and this is proving an excellent choice. Classic pearl surface with considerable sparkle. 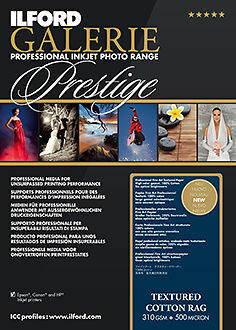 Beautiful photographic results and the most popular inkjet paper in the world. A beautiful 100% cotton paper similar to the old fibre based darkroom papers with a gentle warm tone. A very smooth 100% cotton rag paper with no optical brighteners. A roughly textured, 100% cotton rag paper. A fibre based baryta paper with a beautiful silk (satin) finish. A simple heavyweight, double sided paper for quality printing. Ilfords pearlescent, metallic paper - a very good rival to the popular Chromajet Metallic Pearl. A lighter weight, smooth double sided paper perfect for albums, invitations and other creative printing applications. 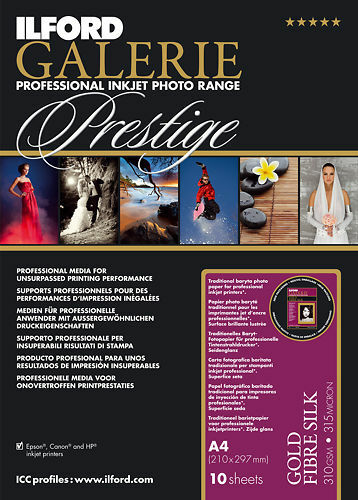 A resin based, smooth gloss paper perfect for photographic printing. An 100% cotton rag with a smooth slightly textured surface. A traditional Japanese Washi (rice) paper with a fine textured surface. 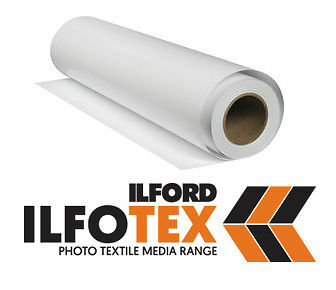 Ilford's Self Adhesive Fabric - perfect for exhibition wall installs, signage & other creative applications. A double sided semigloss duo paper from Ilford - perfect for creating magazine style photo books and albums. 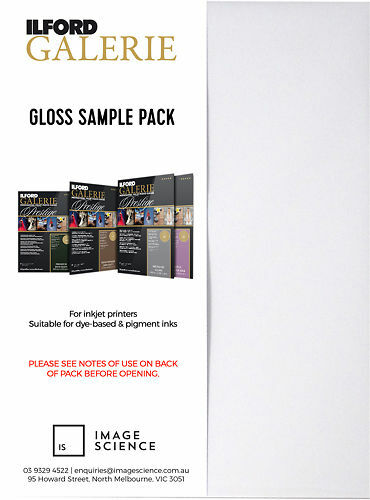 All the gloss & semi gloss papers from the Ilford Galerie range in one handy sample pack! I have been using Image Science for my high quality printing paper for many years now, their after service care is second to none always quick to respond to any queries and solve any problems very quickly. I highly recommend them.